If you were born between roughly 1965 and 1980, then you have a lot of great skill sets, but some have become rarely needed (reading a map) to rarely used (reading cursive) to downright quaint (writing cursive). 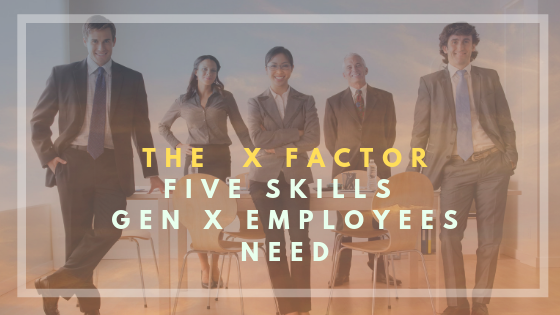 What’s not debatable is that certain skills Gen X employees need are paramount to remaining competitive. As of 2018, Xers were expected to be 60% of the workforce. But you don’t want to just be in the game, you want to be at the top of it. Leverage: inter-generational collaboration. In one study, Gen X employees scored highest for their ability to collaborate. This probably reflects a survival technique honed by a group flanked on either side by huge generations of Boomers and Millennials. Outnumbered doesn’t have to mean outgunned. Continuing to be able to relate to older workers (who are still very much in the workplace), while also not being intimidated by younger colleagues can make Gen X especially valued in generationally diverse organisations. Improve: diversity and sensitivity fluency. Generation X has historically been a more inclusive group with widespread support of those traditionally oppressed or treated unfairly. Fortunately, a lot of the openly hostile rhetoric against groups like women, racial minorities and LGBTQ members has become both legally and socially reduced. What’s more difficult is unintentional internal biases – studies show that while many, if not most, people think of themselves as not prejudiced, we sometimes react or behave in ways that reflect a less than equal approach. Release: traditional organizational structure. While the so-called “slacker” generation was largely unimpressed with the shameless ambition and wealth that characterised their 1980s formative years, Gen X started their careers at a time when a little grey hair still “meant something.” Specifically, it meant deference was owed to elders, patience was required until it was your turn, and experience naturally led to promotion. That’s mostly over. Yes, really. Sorry. So, if someone has something to offer today — even if they graduated yesterday — you can expect employers to listen. Millennials have disrupted the traditional notions of hierarchy by bringing skills that not only don’t require years of experience, but can’t require it – new and emerging platforms, brands, markets, products and ideas that are not mere improvements but truly innovative is what is valued now. Accept: digital era evolution. While Gen Y is considered the first generation to be digital natives, Gen X was exposed to computers young enough that technology has never been a foreign concept. What is more difficult for Gen X is the pace of change – remember when Windows came out with a new version every few years? Heck, remember when iPhones came out with a new version every few years? Don’t resist the Facebook to Twitter to Snapchat to Instagram evolution. You don’t have to have an account on every platform. You do have to understand how they work, what purposes they serve, and . . . be on at least a couple that connect you to colleagues, clients and other professional associates. On the upside, Gen X parents have to look no further than their local mini-me for help. Keep: self-reliant ways of self-improvement. Gen X is the original DIY generation. Generally speaking, Xers prefer to teach themselves, and the digital era has made it virtually effortless to get access to any kind of self-learning device you could need. You can easily find a YouTube video, online chat, podcast tutorial or other self-directed teaching resource that makes all the skills Gen X employees need just a surf, click or download away. In a recent UK study they were seen as the most skilled – clearly indicating that the skills Gen X employees need aren’t required to catch up, but stay up. Robert Kovach is the Director of Leader Success for Cisco’s Leadership and Team Intelligence Practice Area. He has been an advisor to leadership teams of Fortune 500, FTSE 100 and FTSE Global 500 companies on driving business strategy through executive leadership effectiveness and organizational agility. The opinions expressed in this blog are his own and not those of Cisco. Contact him for speaking enquiries. I like this point on digital’s speed and scale challenging even Gen Z very much as I am in the middle of writing a report called The APPlied Human at Work: The World of Work in a Digital era for The Work force Institute at KRONOS. I would love to discuss these issues sometime further in my capacity as Hon Visiting Professor in Workplace Social Health at London’s Cass Business School.